The facial aging process varies from person to person. The main causes are changes in bone density, loss or displacement of fat and break down of collagen and elastin. Anti-aging prevention coupled with minimally invasive facial cosmetic treatments and surgical procedures can be your key to lessening the signs of aging. 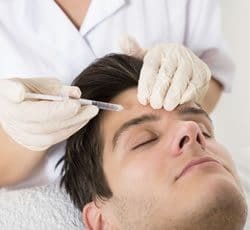 These injectable solutions known as a “denervating agent” temporarily blocks nerve receptors on the muscle, which helps prevent lines and wrinkles from forming. They help reverse various signs of aging like the appearance of deep lines and wrinkles, nasolabial folds, frown lines and crow’s-feet around the eyes to name just a few. Diminish facial lines and restore volume and fullness to your face. Dermal fillers are used to plump thin lips, enhance shallow contours, improve the appearance of recessed scars, facial creases and wrinkles. They can be very helpful if you are experiencing early signs of aging.